Yellowstone caldera eruption fears have spiked as the supervolcano’s largest geyser erupted for the eight time. So far, scientists aren’t certain why the Steamboat geyser continues to erupt, adding to the fears. After years of silence, Yellowstone’s Steamboat geyser, a better show than Old Faithful, has spewed boiling water hundreds of feet in the air eight times since March. Steamboat, the tallest geyser in the vast Yellowstone National Park, isn’t reliable at all, unlike the more famous Old Faithful that belches steam with regularity. But the fact is, Steamboat has been more faithful, at least lately, spewing eight times since March 14, after being silent for nearly four years. But that regularity is terrifying and puzzling scientists. Data collected so far suggests a pattern to the eruptions within the series. If it all “proves out,” the days surrounding June 11-12 are good dates to potentially see the Steamboat geyser erupt, Forbes reported. “Most geysers erupt infrequently, unlike Old Faithful, so Steamboat is not enigmatic in that regard. 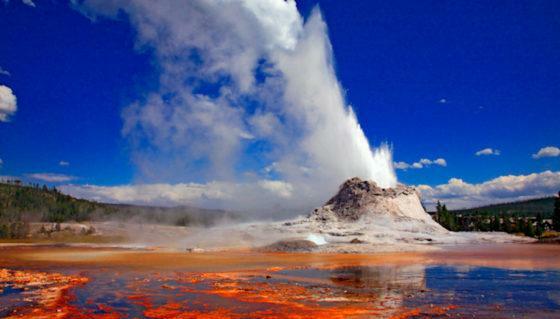 But Steamboat has a mystique about it because it is the tallest active geyser in the world. It gets attention because of this, and rightly so,” Poland said. The day of the first eruption, park staff detected activity on nearby seismometers, thermal gauges, and water discharge on a US Geological Survey stream gauge. Yellowstone National Park staff arrived in time to observe steam from the geyser but no water column. According to the Geological Survey, this is a usual occurrence after a vigorous water eruption. The steam phase can last several hours. Scientists consider Yellowstone to be a “‘supervolcano,” which refers to volcano capable of an eruption of more than 240 cubic miles of magma,” according to the National Park Service. This distinction is based on massive eruptions over 600,000 years ago. Although the caldera is considered active, scientists believe that it is unlikely to erupt in the next thousand years. There doesn’t seem to be a direct relationship between these eruptions and the supervolcano, Poland wrote. “The geyser is reflecting processes that are occurring in the shallowest part of the system — tens to perhaps a few hundreds of meters deep, whereas the magmatic system starts about 5 km down. Geysers are supposed to erupt, and so what we’re seeing is normal behavior.” So once again, we are being told this is all normal abnormal activity.